Good books of GK for SSC Combined Graduate level exam? plz suggest some good books of gk for ssc combined graduate level exam this year. ..
How to crack the SSC Combined Graduate Level Exam? How can I become a CBI Officer while pursuing PG in Information Security & Cyber Warfare? Previous year question papers of SSC Combined Graduate Level Tier-2 exam? Books of which publication is best for SSC graduate level Tier 1 exam? Eligibility criteria of SSC Graduate Level exam for graduate candidate from SMU? Age limit, date, upcoming vacancies, reference books and syllabus for SSC graduate level exam? Good reference books for Mathematics and details of Combined Graduate Level exam?? Eligibility for CBI Officer rank? Re: Good books of GK for SSC Combined Graduate level exam? Combined Graduate Level Examination was conducted by Staff Selection Commission for every year . This Examination may divided into three levels namely, Preliminary Examination / Main Examination and Personality Test . If your qualified in Preliminary Examination then you may call for Main Examination and Personality Test . Qualification :- You should complete Bachelor degree in any discipline from recognized university . Final year candidate of Bachelor degree may also eligible to apply for the Examination . Age limit :- Your age should be 18 years to 25 years and relaxation will be applicable for sc/st candidates and obc candidates . The Preliminary Examination is an Objective type with Multiple choice . You have to complete the Examination within the 2 hours . Extra time will given for Physically challenged candidates . The Syllabus for Preliminary Examination consist of General Reasoning , General Awareness , Numerical Aptitude , English Comprehension . The Main Examination is also an Written Examination and it's an Objective type with Multiple choice . The Syllabus for Main Examination consist of Arithmetic Ability , English Language / Comprehension and Statistics . If your qualified in preliminary Examination and Main Examination then you may call for Personality Test . You may apply for the Examination in both the online as well as offline . You may download the Examination application form from the official website . The Fees for Examination application Rs. 100 for General candidates . Free Examination application for sc/st candidate / Physically Challenged candidates . The Application for Form for this Examination issued during the Month of March and The Examination held during the Month of June . Combined Graduate Level Exam exam is conducted by Staff Selection Commission and also known as SSC-CGL. You first understand the eligibility then I would tell you about the books to be refer for this exam. - Educational qualification : Bachelor degree graduation in any stream from any recognized university. - Age Limit : Your age must be in between 18 years to 27 years. Now I will tell you the reference books that you may be feel useful for this exam. LUCENT'S GENERAL KNOWLEDGE IS BEST BOOK. There are many books present in the market for the preparation of GK. I am not able to download these books free..can u pls suggest any solution?? 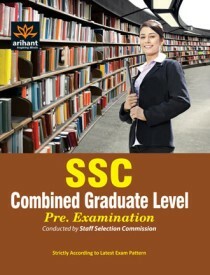 SSC organized the Combined Graduation Level exam for the various post of central government. It is conducted at all India Level. You should be graduate from any recognized university or its equivalent. You should be Indian, Nepal or Bhutan. There are many general knowledge books available for competitive exams.You can download them through online or buy from market. 1. The book of general ignorance ---------> John Lloyd. 2. General knowledge book -----------> Pratiyogatha kiran. 3. General knowledge book -----------> Pratiyogatha darpan. 4. General Knowledge book -----------> Upkar. 5. general knowledge book -----------> G.K Publications. 6. General knowledge book -----------> Surya publications. 7. General knowledge book -----------> BCA series. 8. A to Z Of Everything -------------> Trevor montague. 9. The knowledge book -------------> national geographic. 10. The greatest general knowledge quiz book -------------> Chris Cowlin. 11. 1000 General knowledge quiz questions -------------> Richard Jagger. 12. The ultimate book of knowledge ---------------> Various. 13. The ultimate general knowledge ---------------> Sarah johnstone. 14. Quix master ----------------> Nick Master. 15. General knowledge book ---------------> John paton. 16. Multiple choice general knowledge quiz book --------------->Various. 17. General knowledge book ------------->Suganya books. 18. General knowledge --------------> Khanna. 19. General knowledge -------------> Alka publications. 20. General knowledge -------------> Varma etc. GENERAL KNOWLEDGE IS BEST BOOK. .....You want to know the good books for SSC combined graduation level examination..SSC stands for school service comission.This examination organized by higher school authority every year.Through this examination higher school teacher will evaluted every year. Some relaxation for the reserved candidate as per as govt. rules..
Student must qualify the written examination.Then the shortlisted candidates has to give interview,after that final students are selected.. The book of general ignorance - John Lloyd. Multiple choice general knowledge quiz book -Various. general knowledge book - G.K Publications. General knowledge book- Pratiyogatha kiran. General knowledge book - John paton. The greatest general knowledge quiz book - Chris Cowlin. Wishing you bright future..Hope this may helps you a lot. There are so many books which candidates can refer for their preparation of SSC exam.these are some good books for the same. Which book is considered best for the preparation of GATE exam for a Mechanical Engineering student ? Whether the book by Abdul Mubeen is good or not ? Suggest some books which are considered best in Organic Chemistry for the preparation of IIT-JEE ? Whether the book by Morrison and Boyd is enough or not ? Whether the Arihant Publication's solved book of NDA & NA available in Market? Where to get this book online? Suggest the right pattern of XAT exam?